Ridley Scott returns to his Sci-Fi roots in one of the most highly anticipated films this year, but is it all it’s cracked up to be? The initial problem that Scott faces is that he’s shot himself in the foot by creating a film in his Alien universe, which got fanboys and the general moviegoing audience very, very excited. There’s always high hopes for a Ridley Scott film (often dashed) but this time it really did set a precedent. So let’s begin by saying do not expect this to be an Alien film because it isn’t. At all. Which isn’t necessarily a bad thing. However, when the film finished I was a bit surprised by the route it had gone down. Rarely was I at the edge of my seat or biting my fingernails, instead I was watching wide eyed and trying to absorb everything – where Alien was simple, Prometheus is hugely and unnecessarily complicated. This is mainly due to the fact that Damon Lindelof, of Lost fame, is the scribe and a lot of people have been fuming about how he is all ideas and no actual content or context, which I have to agree with. Just because something looks interesting with all different bits, it doesn’t mean that when you start putting it together (as people always do) that the result is something you actually like. 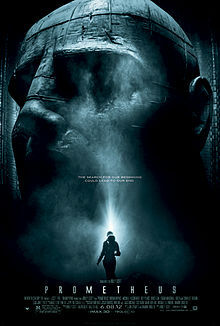 Prometheus is full of good things, just not necessarily things that work well together. In case you don’t know, the idea is that the film takes place before Alien etc. (I imagine it doesn’t even want to include AvP prequel stories!) where a couple of doctors discover a map to a planet where they believe they will meet their makers. As they land on the planet, things start to turn a bit sour. The overarching theme is the idea of the big questions in life, who we are and where we come from, but also a chicken and egg theology that tries it’s best to keep some faux-intelligentsia that Lindelof likes to think he’s a pro at. Much like Lost, he thinks he understands the audience but he doesn’t, he takes advantage of trust and it’s something that he will come up against time and again. What I love about the film, I also hate and though Lindelof is full of big ideas, I can’t help but feel that he doesn’t have the methodology to pull them off. In any case, the set design and general production is impressive and the 3D iMax that I watched it in was incredible and for that alone, it was definitely worth the watch. However, what was also hugely impressive was the cast. Fassbender proves he is an acting heavyweight by pulling the film together and I would say is the central character to the piece rather than Rapace, who has to put on an English accent (why not just use someone English?). Charlize Theron does her bit but is somewhat useless, as is Idris Elba as the cool pilot and to be honest, everyone else who just become a bit of fodder. Essentially, the acting is great but the characters are not fleshed out at all which is a huge downfall. Also, looking back, the story kind of makes sense, but not really. There is a lot of plotholes which I’m sure will be widely discussed for a while but it’s made up of great set pieces. This isn’t really a monster movie, in fact it’s not a horror at all, or even a chiller, it’s a Sci-Fi film that would rather have a huge orchestral action score than a small, lingering, ‘less-is-more’ approach that defined Alien. If you’re willing to take that onboard, sit through some pretty incredible 3D or if you want to see something that you know you’ll enjoy then go to your cinema and see it. But it’s not genre-defining, it’s not scary, it’s not original, it’s not Alien, but I liked it nonetheless.